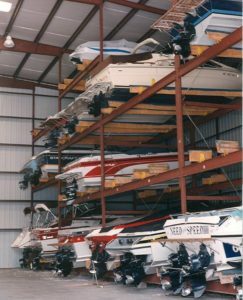 With 300,000 sq ft of heated and unheated indoor storage, there’s room for over 600 boats. And for outside storage, Bay Harbor incorporates the latest shrink wrap material and technology to fully protect your investment. Enclosed rack storage. Courteous & knowledgeable lift operators on duty 7 days a week. Ample parking for our dry stack customers. Wash racks and weekend docks available upon request at no additional charge. Keep your boat on its trailer and launch it yourself. Protected in our non-heated, inside storage facility, you may launch or retrieve your boat at any one of Bay City’s local ramps. It's the perfect solution for smaller boats plus you keep it here year 'round and enjoy all the benefits of Bay Harbor.